Farm to fork is one of the most popular trends in farming these days. This movement is defined by the desire to increase consumption of local food and to eliminate the intermediaries between food producers and consumers. One of the most common examples of this trend in action would be a farmer’s market where consumers can purchase food directly from the food producers even if they’re not technically a farm. The driving philosophy behind the farm-to-fork movement is food traceability. Fears of not knowing what goes into our food aren’t really going anywhere, and an obvious solution to that fear is to buy the food directly from the producers themselves. Not only does this create a direct relationship between the producers and consumers, but it also creates a clear line of responsibility should reasonable food safety standards not be met. This both protects consumers and encourages food producers to meet all the necessary safety standards with whatever they’re making. While many forms of produce have already been distributed using this approach, it’s a bit more uncommon for wheat to do the same. Fortunately, there are sources all over the country that are using farm-to-fork methods for wheat to ensure safety and create a better experience for consumers and the food industry as a whole. Learn why this distribution is the future of wheat milling and consumption. While fears about food safety tend to be the driving force behind the movement, there are a lot of other benefits you can enjoy when eating locally grown food without going through an intermediary distributor, although the use of a local distributor generally doesn’t compromise the end goals. Local distributors are generally okay because one of the major goals is boosting the local food economy. When local restaurants, supermarkets, and schools are using locally grown produce, it means that local small farms don’t have to rely on national demand and competition from all over the country. Major nationwide distributors aren’t going to care about the plight of a small farm, but when distributors only have access to local farms in specific areas, that’s going to increase the sustainability of family farms as well as increase the freshness, taste, and nutritional value of local food and ingredients. Visit any farmer’s market and you’ll find a multitude of different food items you can purchase and consume right there. You’ll find apples, tomatoes, cabbage, and so much more that a farmer simply took off their farm, cleaned, threw in a basket, and presented them for sale. While that works great for items that are consumable right off the farm, wheat is a bit different. Instead of presenting it for sale after pulling it off the farm, it has to go through an entire milling process. Wheat can be used for a variety of different foods, and each will require a slightly different milling process. This usually involves an entire facility to mill the wheat in industrial quantities, and that kind of facility isn’t usually found on the wheat farm itself. That means the wheat could potentially be traveling hundreds of miles before even reaching a facility for milling. 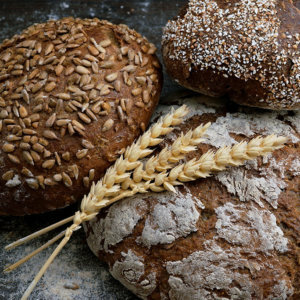 After arriving, it’s milled in various ways depending on whether the wheat is for hard flours like pasta and bread or soft flours like cookies and pancakes. In many cases, the farmers will be disconnected from these milling facilities having no influence whatsoever in the way they operate. This creates another barrier between the consumer and the farmer, and that’s just the beginning. After the wheat has been milled, it could be sent off to distributors all over the country. At least the millers themselves could distribute the wheat products to consumers, but even that may be an obstacle to true farm-to-fork methodology in the future. California has always been on the forefront of this farming movement, so it’s no surprise that wheat is beginning to adopt the same path as its more easily consumable produce counterparts. At the California Wheat Commission, we’re dedicated to supporting research to improve the quality of local wheat and its marketability for the benefit of local farmers and consumers. Our research and quality control is all publicly accessible, so you can be sure that California wheat is a crop you can count on. Contact us today to learn more about local California wheat, and discover what you can do to create a future for this incredible and essential crop.